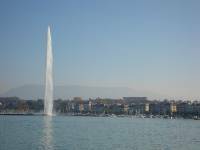 Geneva is a gorgeous city but it isn't too much of a tourist town....actually there isn't much here other than lots and lots of banks and really nice cars! We were hoping to see Chateau du Chillon...one of the best castles in Europe, but it's closed for the month. We made the best of it and just walked around town. The hostel was great and it had a fully-equipped kitchen so we grabbed some pasta from the market and a bottle of wine and cooked ourselves a feast! Cheap and delicious!